Incontinence is an inability to control urination, that is, to keep from urinating until you want to release it. Stress incontinence and urge incontinence (“overactive bladder”) are the most common bladder control problems. Control of bladder function is a very complicated process involving specific muscles. In normal bladder function, nerves in the bladder signal the brain when the bladder is filled with urine. This results in the urge to urinate. Just before urination begins, the brain sends a signal to the large bladder muscle (detrusor muscle) to contract, to squeeze urine out. At the same time, the brain signals the sphincter muscles around the urethra to relax so that urine can be released. In many cases, incontinence can be controlled by exercises and medication. Bladder control problems are common in older people, especially women. A urinary tract infection is a complication that can be avoided by treating incontinence. Incontinence, or loss of bladder control, is common in the older population. Approximately one-third of all older residents residing in a hospital or a nursing home are incontinent, and about 10% of elderly living at home have a problem with bladder control. A physician will diagnose a bladder control problem after conducting a physical exam and taking several simple tests, which include a urinalysis, blood chemistries and catheterization to determine residual urine volume, or the amount of urine left in the bladder after voiding. A thorough description of urinary symptoms is important to help the physician make the diagnosis. The two most common types of incontinence are called stress incontinence and urge incontinence (known as “overactive bladder”). Stress Incontinence: Stress incontinence is a leakage of urine that occurs during certain everyday activities. 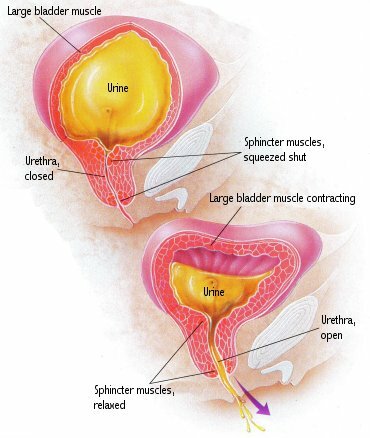 This type of incontinence is due to weakened sphincter muscles around the urethra, the canal that carries urine from the bladder. Sneezing, coughing, laughing or lifting heavy objects cause these muscles to relax temporarily. If the muscles are weakened, a small amount of urine can escape. This occurs usually during the daytime, and in most cases only a small amount of urine leaks from the bladder. Stress incontinence occurs most often in women, after pregnancy, menopause or if they are obese. Often after pregnancy, there is a weakening of the pelvic floor muscles that help to maintain the urethral sphincter tone. Estrogen deficiency, seen in post-menopausal women, is also a cause since estrogen directly affects the sphincters around the urethra. Stress incontinence is rare in men unless there has been damage to the sphincter muscles during prostate surgery. Various drugs are useful in treating stress incontinence. These include phenylpropanolamine, pseudoephedrine, imipramine and estrogens. Special exercises may help strengthen the pelvic floor muscles. In severe cases that do not respond to drugs, surgery may be required. Urge Incontinence: An overactive bladder is simply the result of an unstable detrusor muscle that contracts even when the bladder is not full. This is the most common type of incontinence occurring in older patients. In urge incontinence, voiding may begin with little warning. Often the warning comes after urination has begun, resulting in urine leakage. These patients may feel an urgency to urinate even when there is little urine in the bladder. Common causes of urge incontinence are inflammation or infection of the urethra or kidney, kidney stones or tumors. Urge incontinence can also be a result of stroke, parkinsonism or spinal cord injury. The goal of therapy is to stabilize the detrusor muscle, “calming” it so it does not contract when the bladder is not full. This helps to overcome the feeling of urgency with an overactive bladder. Behavioral changes and medications can work to meet this goal. The drugs used for this condition include oxybutynin, imipramine, propantheline and dicyclomine. A new product is called Detrol (tolterodine tartrate). These drugs are usually given over a 2- or 3-week trial period. Behavioral changes include exercises that are designed to train the bladder to control urination. Sometimes medication times or bedtime can be adjusted to avoid accidental bedwetting.